It's 467 ft., per official Durst-Fetner press release. The original smokestacks at the IRT Powerhouse seemed to be ~ 288' tall (based on info at emporis). The one existing appears to be taller than the BIG plan, but I can't find info on the height. Some screenshots from that video. A tower worthy of the waterfront. Better location than Gerhy's waterfront in that it is not stuck behind the hideous chelsey piers. Lets see if the community board ruins this one. Apart from the western addition, the 59th Street powerhouse underwent no significant exterior alterations up until the building’s acquisition by Consolidated Edison (ConEdison) in 1959. Immediately upon taking control of the plant, ConEdison embarked on a series of mechanical improvements executed over the course of the next decade. In addition to the removal of superannuated machinery, this resulted in the creation of a number of new street level openings in the building’s north and south elevations, the removal of four of the plant’s six original smokestacks, and the addition of a modern, 500-foot reinforced concrete stack in place of the number 1 smokestack in 1968. ConEdison removed the building’s cornice that same year. The number 2 stack was removed in the late 1970s and the number 5 stack in 2009. One concern I do have is that when this building ages that pearly white facade will be tarnished with rust stains. Its sloping and probably made of concrete, that doesn't fair to well against the elements. Considering that some pretty nice buildings will rise in this area, it's a shame that Avalon will go for a limbo award (i.e., a very low bar) with the POS it plans to build here. Residents weighed in Wednesday night on a proposed residential pyramid project in Hell's Kitchen. 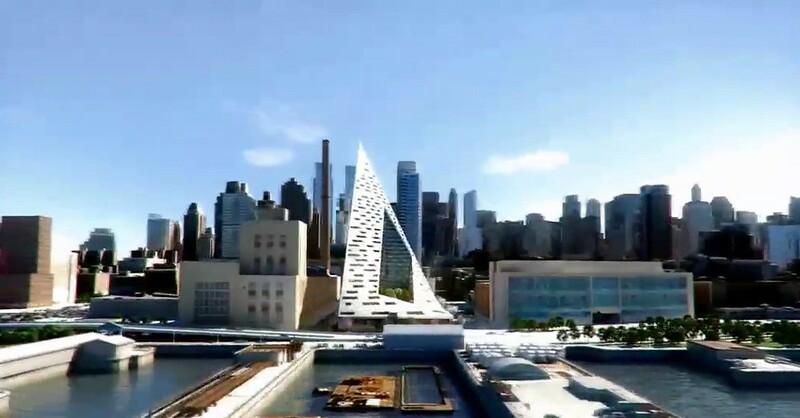 HELL'S KITCHEN — Neighbors who could one day live in the shadow of a Hudson River pyramid got their first opportunity to weigh in on Danish architect Bjarke Ingels' proposed project at an informal presentation Wednesday night. Joined by developer Douglas Durst, Ingels told residents, City Councilwoman Gale Brewer and members of Community Board 4's Hell's Kitchen land use committee about his dreams for a residential complex between 57th and 58th streets and 11th and 12th Avenues. The 700-unit complex would, Ingels said, create a bridge between the neighborhood and the waterfront, akin to projects in his hometown of Copenhagen such as the harbor pool. It would also meld the Danish habit of placing gardens in the center of residential complexes with the New York motif of dense skyscrapers. The building's townhouses, which would rise above a first level of retail shops and a cultural space likely to be occupied by the International Center of Photography, would bear bay windows and balconies staggered in a "fish bone structure," Ingels said. For all the design's architectural splendor, sticking points for the project's approval — the pyramid has yet to begin the city's seven-month land use review process — will include the perceived presence or absence of community benefits. Brewer and CB4 members pressed Ingels and Durst to add more green space on the 110,000 square foot lot accessible to the public. Although an elevated courtyard forms the centerpiece of the structure, that area is slated for private use only. "We're like a pain in the neck community, here in New York," Brewer said, before explaining that trees planted around the development's perimeter would not be enough. Brewer also asked Durst to confirm that the largest retail space on the ground floor would not go to a Costco, some form of "urban Costco," or a "fake grocery like Walmart." Durst said they would not bring in a tenant like that, and instead were looking for an actual grocery store, which would fill a need in the neighborhood. The Board's emphasis on keeping affordable housing in the area will create another challenge for Durst and Ingels. While the two plan to make 20 percent of units in the pyramid affordable, they have not agreed to make those apartments permanently affordable. Several board members asserted that they are weary of deals that allow affordable housing commitments in the neighborhood to expire after 20 or 30 years. "There's going to be a fight in this community for permanently affordable," Brewer said. "Just so you know, one way or another it's going to be permanent." I absolutely love this proposal. But why are Brewer and CB4 getting bent about public green space when the park is across the street? They better not mess this up. This is fantastic! A great piece of design. where the little green space we do have already exists. I'm sure the green space issue won't be much of a sticking point- That will go to the lack of permanent affordable housing! This and nothing else, is the biggest hurdle/hoop community board 4 will make a developer jump over/through. I've decided I don't like this one. It frustrates me that all this gimmickry is required to make a building interesting. It's a shallow, pointless gimmick at that (visualize an orthographic top view). Feeble. It does not please me.